Extraordinary Roots-Rock & Country-Soul. It's like Dwight Yoakam hopped a freight on the Soul Train. 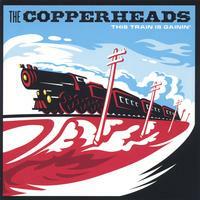 On the Bartered Soul label comes a singular roots-rock album, This Train is Gainin,' the second LP from The Copperheads. It smokes on down the track, effortlessly carrying listeners (even those in the pop/rock congregation) through a landscape of wacked-out Nashvillian sad songs, un-easy love songs, and less-than-blessed appeals to Heaven. This Train is Gainin' was recorded at the seriously underground studio, The Blätz Litehouse. What the album lacks in big label budget it makes up for in extraordinary songs, arrangements, and execution. The first track, "She Lives in Dallas," is extremely catchy. It evokes Dwight Yoakam, had he written a Mayberry-inspired lyric and cut the song at Stax Studios in Memphis. And while some might think covering "Here Comes the Rain Again" is just a cute idea, it sounds sublime---as if Gram Parsons & Carole King teamed up to pen it especially for the Copperheads. I saw these guys live at a local pub and really enjoyed their playing. They had a good mix of country and soul, and even rocked it just a little bit. I give it four stars because the songs are good, but often start to sound alike. This can be a good or bad thing depending on how you look at it. Overall, the CD is good, but I think I enjoyed them more live. With too many bands steeped in alt-country’s rowdy clichés (i.e. bad grammar and drinking), it’s refreshing to hear the soulful, sophisticated songs of The Copperheads. Will be recognized as an Americana classic! A terrific LP of Americana & Country-Soul. That's no jive. The only reason you might not have heard them is because they toil away in the Minnesota tundra, not exactly friendly territory for musicians whose loyalty lies with Southern music. There are several classics-waiting-to-happen on this CD. 'Last Sad Song' sounds like existentialist Willie in his prime. 'Drive On' is as good as this genre gets. It's a wonderfully poetic take on looking at the world through a windshield & the signs that cross your path when you do. 'Sweet Azalea' is a cross between the Allman Bros. & the Eagles, sinmply a gorgeous tune. 'This Train is Gainin' smokes down the tracks, leaving the uphill battle of a parolee with no hope for real pardon in the echo of it's whistle. Finally, I can't say enough for 'Fireworks,' a killer tune with a killer lyric, figuratively. Never has a songwriter made one last tryst & the subsequent murder sound like such a sweet way to go. It's heavenly. I just moved to Minneapolis a few months ago and discovering The Copperheads is one of the best things to happen to me since I've been here. I think I'd pretty much given up on ever again hearing country-blues the way I thought it should sound, and then I was saved one night at Lee's Liquor Lounge when I stumbled upon the CD release show for "This Train is Gainin'." The album is well balanced and excellently demonstrates all that these guys are capable of, like Ray's wonderful melodies and charming lyrics, the sweetest harmonies, rousing guitar solos, and a "just right" rhythm section with some keys thrown in for good measure. I listen to this album at least once a week (along with the previous album) just to get my fix, and when I'm not actually listening to it I'm invariably singing some part of it that's stuck in my head-- "She Lives in Dallas" and "Last Sad Song" are particularly persistent. Buy this album, share it with your friends, and join me in singing the praises of these champions of country music! !